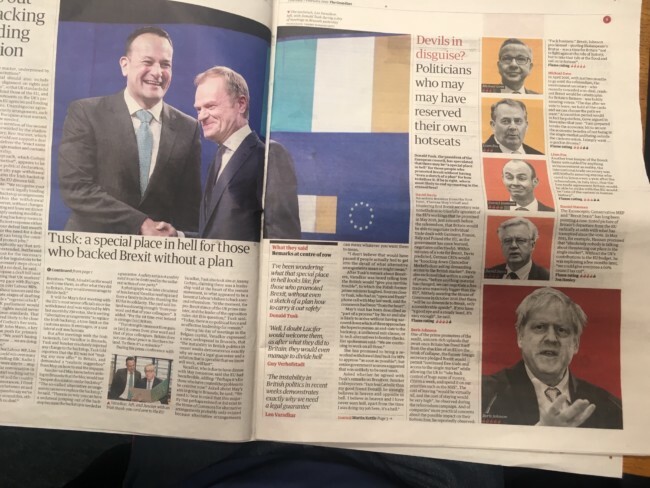 When Donald Tusk, president of the European council, sent Brexiteers and Leave voters to a “special place in hell“, the Guardian knew who he was talking about: Tories. In a story entitled “Devils in disguise?” the paper looks at the “politicians who may have reserved their own hot seats.” They are, in no particular order: David Davis, Bois Johnson, Michael Gove, Liam Fox and Danial Hannan. All Tories. The Guardian has absolved: Kate Hoey, John Mann, Dennis Skinner, Frank Field and Gisela Stuart, all Labour MPs at the time of the EU vote who campaigned for Britain to Leave the EU. Why is that – why is it that the paper of the Left fails to spot that people on the Left back Brexit? Labour voters back Brexit. They still don’t get it. Andy Burnham, aLabour MP during the referendum and now mayor of Manchester, said at the time : “We [Labour] have definitely been far too much Hampstead and not enough Hull in recent times and we need to change that.” They still need to.